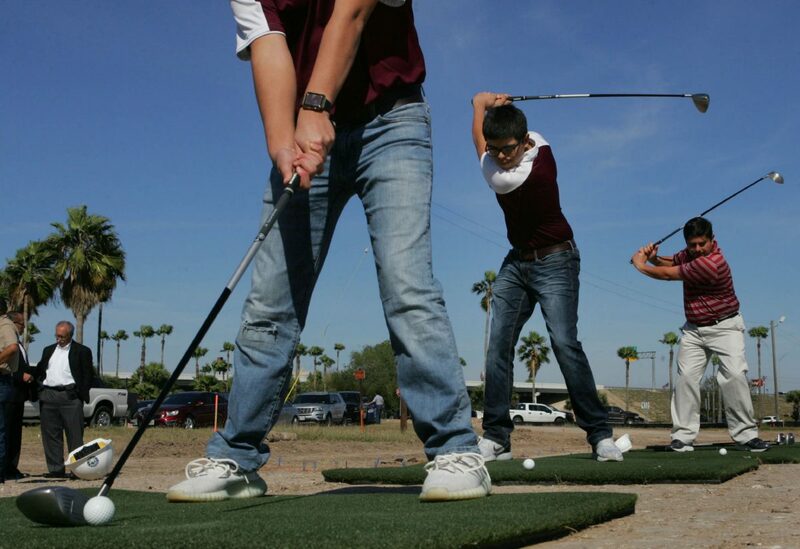 PSJA High School golfers Jacob Flores, 17, behind center, and John Mata, 16, front, 16, hit a plastic golf balls off a mat at the site where Top Golf will be located during a ceremony Wednesday, Jan. 10, 2018, in Pharr. Construction on the facility is underway and should be completed in about 10 months. PHARR — As Topgolf, a sports entertainment venue, broke ground here Wednesday, City Manager Juan Guerra said the city is paying roughly $5 million in incentives over 10 to 15 years. The 11th Topgolf in Texas will be located off Interstate 2/Expressway 83 and Jackson Road near AtHome and Costco. It is expected to open later this year, city officials said. In order to lure Topgolf to Pharr over neighboring competitors such as McAllen, Mission and Edinburg, the city is giving $1.2 million in cash incentives, as well as a 50 percent reimbursement of sales tax for 15 years and 50 percent reimbursement of property tax for 10 years, Guerra said. Topgolf, which is building a 55,000-square-foot facility, will create 350 jobs, Guerra said. The coveted 15-acre property along the expressway is worth about $5 million, Guerra said, which Topgolf paid for. There will be 72 climate-controlled hitting bays that can host up to six people. The Dallas-based company estimates approximately 300,000 visitors in its first year of operation. Arco Murray of Dallas is the general contractor on the project. Representatives with Sen. Ted Cruz, Rep. Vicente Gonzalez, and several state and local officials were at Wednesday’s groundbreaking. The last major incentive deal Pharr gave out was in 2012 when the city paid Costco $11 million, including $6.5 million to help purchase the property, $1.5 million for construction and $3 million in incentives after opening.